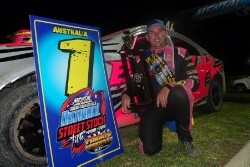 The grand final of the MJS Street Stock Series will be held this Saturday night at the Murray Machining and Sheds Murray Bridge Speedway. The field of in excess of thirty drivers will contest the Grand Final, which promises a great night of racing, with National Champion, Anthony Beare heading the line-up. Drivers might be able to take comfort in the fact that Beare has not won a Feature Race in South Australia this season, and has not raced for a month, so the National Champion may be a little rusty, but apart from that Beare will again, as always, be incredibly hard to beat. Mick Dann, who finished second to Beare in the National Title is also in the field, as is Nigel Reichstein, who has had a very good season. Corey Sandow also of Victoria, who finished second to Beare in 2018 in the National Title is also entered, ensuring a great night of racing. Justin Brumfield, Darren Flatman, Craig Buchanan, Jayden Edwards and Neville Nitschke are also amongst the strong line-up. Racing will commence at 4.30pm CST, with events scheduled also for Junior Sedans.